The biggest issue still on the table is pay. The unions are asking for 2% in salary increases every six months – about 4% per annum – and management is currently offering 2.9% every year. While you were on holidays, negotiations continued between the University’s management and staff over the Enterprise Bargaining Agreement (EBA). After the five days of strike action in first semester, some progress was finally made but the negotiations are far from over. 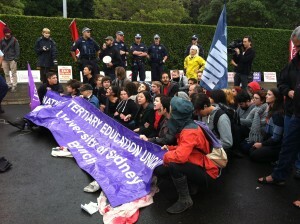 “We’ve had some big wins, but there is still more,” Michael Thomson, President of the National Tertiary Education Union (NTEU), told Honi. The University’s 538 academic casuals saw large steps taken to secure their employment. The unions replaced 120 of these academic casual positions with early career development positions, which offer more job security and pathways for promotion. The unions also secured a $2 million staff development fund designed to offer staff support and training as well as a guaranteed Indigenous employment clause. At the moment the university only has 55 indigenous staff, but is locked in to employ 172 by 2015. The biggest issue still on the table is pay. The unions are asking for 2% in salary increases every six months – about 4% per annum – and management is currently offering 2.9% every year. The University management contends that this is a fair increase given that Sydney inflation is 2.8%, especially in light of the federal government’s recent efficiency dividend – an annual funding cut designed to reduce costs and increase efficiency. The unions believe that 4% is reasonable given the university’s recent revenue boost, larger staff workloads and figures released by the Department of Education, Employment and Workplace Relations which show that national system public sector employees, such as university staff, receiving an average increase of 3.9% per annum. This issue is of such importance to staff that they are willing to concede two of their other major demands if the 4% salary rise is met. They would sacrifice journey insurance, which covers injuries sustained en route to and from work, and negotiate on their current demand for 17% in superannuation for all staff. In light of these outstanding issues the strikes are set to continue. The first will be on Tuesday, August 20, which is coincidentally on the same dates as the National Day of Action against cuts to tertiary education. Another strike, picket and rally are also scheduled for the University’s Open Day on Saturday, 31 August.